A cold front will move through the Finger Lakes tonight, but not until after a mild day Saturday. Click image to enlarge. 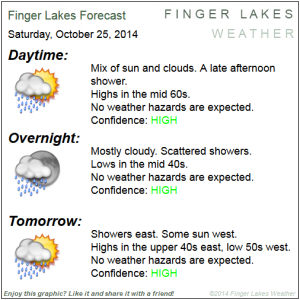 The weather will be fairly tranquil for most of Saturday. In fact, it should even be a nice day for a while. 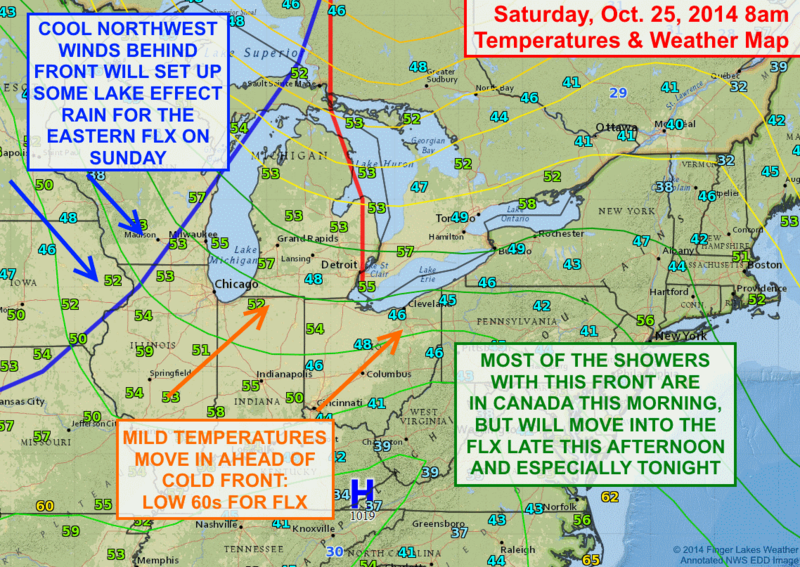 An approaching front will push warm air into our area before it arrives in the Finger Lakes tonight. High temperatures should climb into the low 60s for most places as clouds and sun swap control of the sky back and forth throughout the day. A couple of showers are likely late in the afternoon, but most of the showery weather will move in after dark tonight. 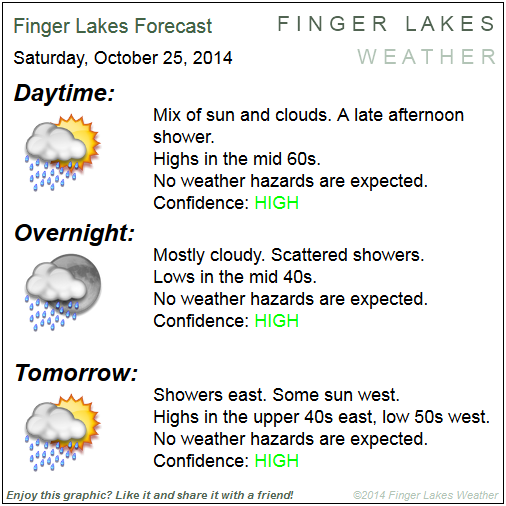 Finger Lakes Forecast for Oct. 25/26, 2014. Click image to enlarge. As the cold front pushes through overnight, cool northwest winds will react with the warm waters of Lake Ontario to produce some lake effect rain showers. While areas in the south and west Finger Lakes will see some sun on Sunday with temperatures in the low 50s, areas further east and north will be locked in the clouds, with occasional showers and drizzle and highs in the upper 40s at most. More details on who should see what tomorrow morning. 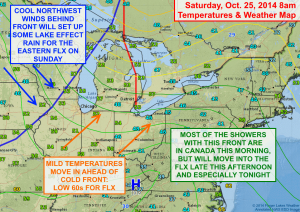 Any lake effect should end Monday night. Monday looks pleasant, but Tuesday is the best day of the week with a mix of sun and clouds (maybe an early shower) and highs in the low 70s!